From time to time, I find things on Facebook that make me think and that I enjoy spending some time on, and one of those things is the focus of today's blog post. Someone came along with a graphic that called upon us to describe ourselves using three fictional characters. That appealed to me. Naturally, I had to make it more difficult for myself. I did limit myself to characters in crime fiction, and then there was the natural limiter that my choices had to be ones that had made it onto the (large or small) silver screen; otherwise, I wouldn't have photos of any of them to use in my graphic. In case you don't recognize them all... Left: Sheriff Walt Longmire's dispatcher, Ruby. Right: Ann Cleeves' Vera Stanhope. 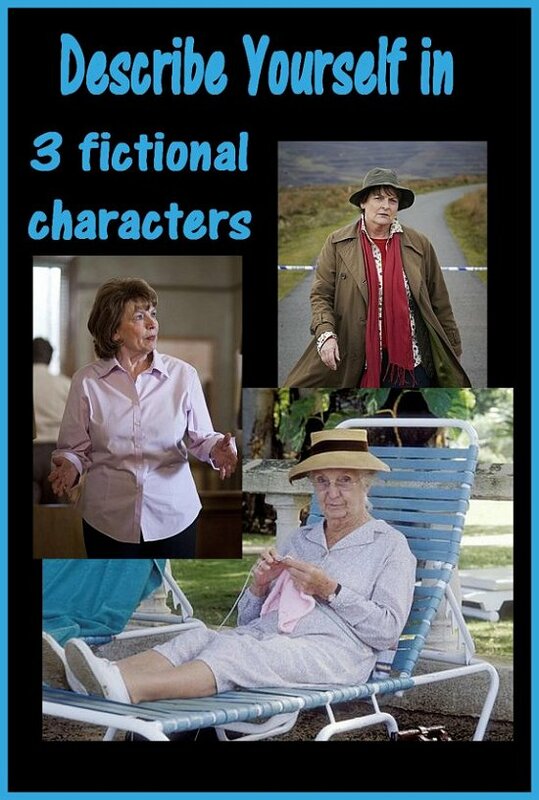 Bottom: Miss Jane Marple (although I haven't knitted anything in that shade of pink yet, and my hat's a Stetson). Still Vera, who does get out and about up there in Northumberland, but Eowen, the slayer of the Witch-king of Angmar? And Walt's deputy Vic Moretti? Yikes! I was definitely feeling much feistier that day! What about you? 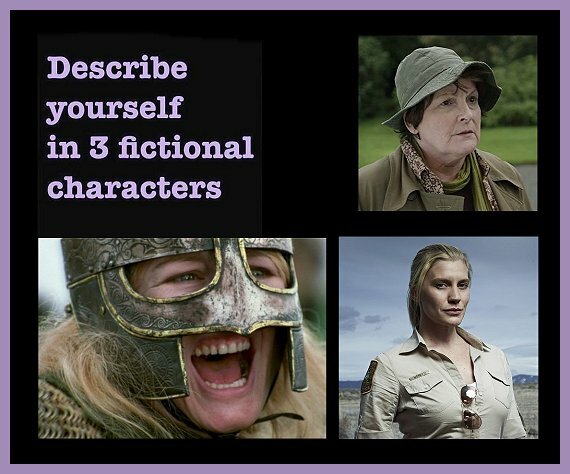 Which three fictional characters would you choose to describe yourself??? Inquiring minds would love to know! Oh, this is fun, Cathy! And even though we've never met, I can see exactly how you'd have chosen those characters for yourself. Hmm.....this is great 'food for thought,' for which thanks. Wow. I wish I could be like the characters I like. So, I"ll do a wish list of those who are part of my alter-ego, not my real self, but who I'd like to be. First is my all-time favorite detective, V.I. Warshawski, Chicago resident, feisty, brave, smart, dog-lover, independent woman. Then I'd like to have aspects of Paola Falier, English professor in Venice, fantastic cook and spouse of Guido Brunetti, police detective, quick-witted and smart, and Elettra Zorzi, computer "wiz," and sophisticate. My choices feel so plebian next to yours!